Normal Heights is an relatively older part of town near Balboa Park in San Diego. Normal Heights is known for its music festival, charming houses, and row of local businesses. Just south of Normal Heights is where the 15 and 805 meet, just west is University Heights, just north is Mission Valley, and just east is Kensington. Normal Heights has many older homes with a lot of charm. The main row of businesses, on Adams, has antique shops, restaurants, bars, and boutiques. Normal Heights has a handful of annual events, such as Adams Avenue Street Fair, Unplugged, Taste of Adams Ave, and Art Around Adams. Street Fair is Southern California’s largest FREE music festival, which happens in late September. Locals and tourists love walking down Adams and checking out the shops and places to eat and drink. Normal Heights is becoming known for attracting great restaurants and bars. My personal favorite spot in Normal Heights is Blind Lady Ale House (affectionately known as BLAH.) BLAH has a wide variety of craft beer and food, and is always a good time. 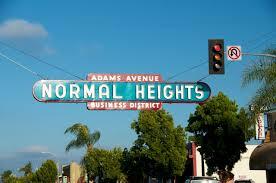 I personally love Normal Heights--you might too! GET INSTANT ACCESS TO NEW LISTINGS IN NORMAL HEIGHTS CA! Receive automated email alerts the moment a new listing matching your exact specifications enters the market. - New Listings Added Every 15 Mins...Don't Miss Out! Learn More! Listing information last updated on April 26th, 2019 at 12:33am PDT.